Louisiana Catch is nominated for the prestigious Pushcart Prize. Sweta is voted Changemaker of the Week. Shelley Workinger talks to Sweta about the foods her characters like to eat in Louisiana Catch. (Host of #ConversationsLIVE) about Louisiana Catch, writing, facing fears, and what’s next. Sweta is named one of the top 25 women changing the world through her books by Conversations Mag! W2O Podcast: In this episode, Sweta discusses the role of wellness in creativity, predicts the future of the wellness space, unpacks the importance of access to information, and shares her love of Ol’ Blue Eyes. Hear the podcast. Louisiana Catch is featured in Women’s Fiction Writers newsletter Read ON!!! Louisiana Catch makes it to the list of Top 50 Fiction Books of 2018. Sweta does a radio interview with Cyrus Webb (Host of #ConversationsLIVE) about Louisiana Catch and how she tackles difficult social issues via her writing. Author Stephanie Post interviews Sweta about characters, writer’s block, and the writerly mind. 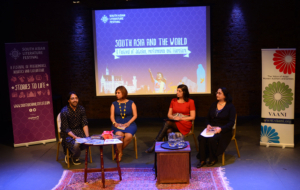 Award-winning writer Archita Mittra interviews Sweta about her creative process, multiculturalism, writing projects and all the little ways one can make a difference to the world. WriterOfTheWeek does a video interview of Sweta about Louisiana Catch, catfishing, dating and much more! The Asian Writer does a feature on Sweta. Sweta does a podcast interview with Book Fetish Podcast about Louisiana Catch and the inspiration behind the book. “I got tired of others defining what Indian women look like, behave, do, or feel. I couldn’t find stories of my generation & women like myself, so I created AHANA.” Sweta’s interview in Eyra Magazine. Women’s Fiction Writers Association first podcast interview includes a conversation with Sweta. Sweta does an author happy hour interview with Women’s Fiction Writers Association and talks about her interest to know what wine Ernest Hemingway drank during his times… amongst other literary things (watch the video below). Author Soulla Christodoulou interviews Sweta about her favorite writing quotes and how that inspires her writing. Sweta does a tête-à-tête with Aabha Vatsa about writing and inspiration (watch the video below). Jill Elizabeth interviews Sweta about the backstory for Louisiana Catch and additional information about the book. Sweta does a tête-à-tête with Deborah Kalb. 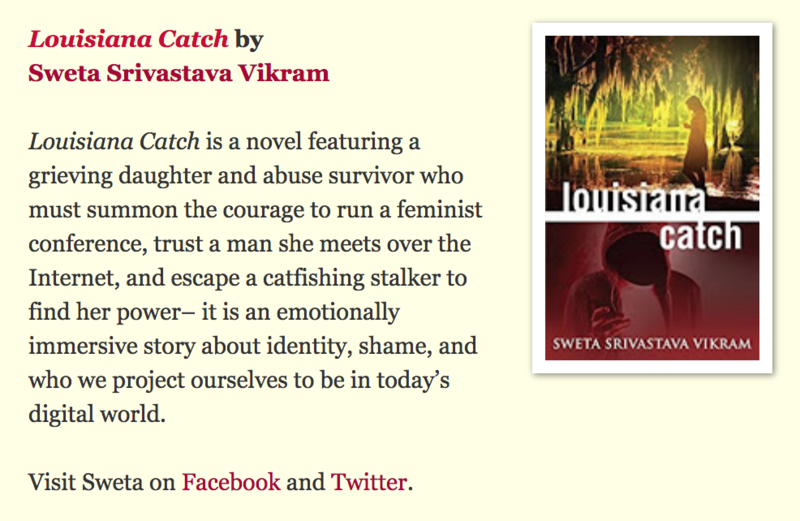 Chick Lit Central mentions Sweta’s book Louisiana Catch on their BOOKSHELF page. More reviews and still #1. Heather from Story Scribes does a Thursday Threes: Q&A with Author Sweta Srivastava Vikram. Michelle Dunton interviews Sweta about her characters in Louisiana Catch and writing about grief (watch the video below). Urban Book Reviews interviews Sweta. The founder of Sayfty, Dr. Shruti Kapoor, interviews Sweta for the incredible South Asian Magazine, The Aerogram. 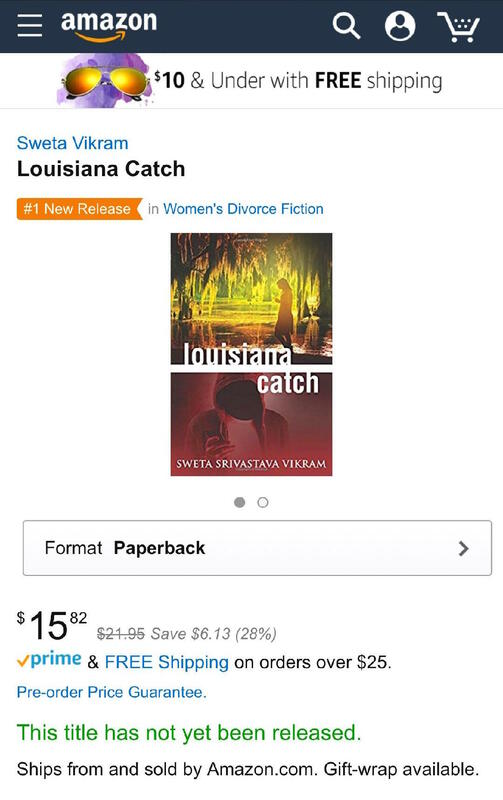 Sweta’s upcoming novel, Louisiana Catch, is the #1 new release on Amazon under a sub-category in women’s fiction! Pakistan’s most widely read English newspaper, Mag The Weekly, interviews Sweta: Creative writing can change someone’s world – Sweta Vikram. 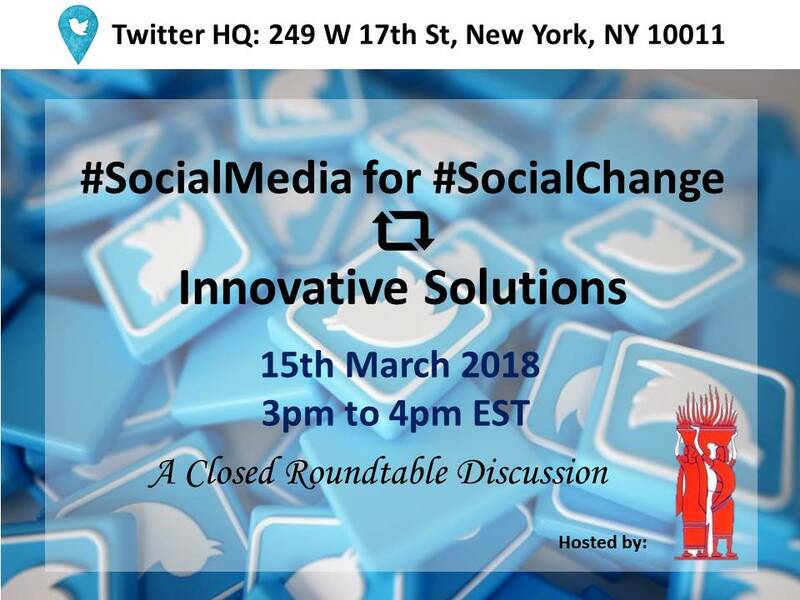 Sweta is invited to the Twitter Headquarters to participate in a closed roundtable discussion: Social Media for Social Change: Innovative Solutions hosted by Centre for Social Research together with Twitter. 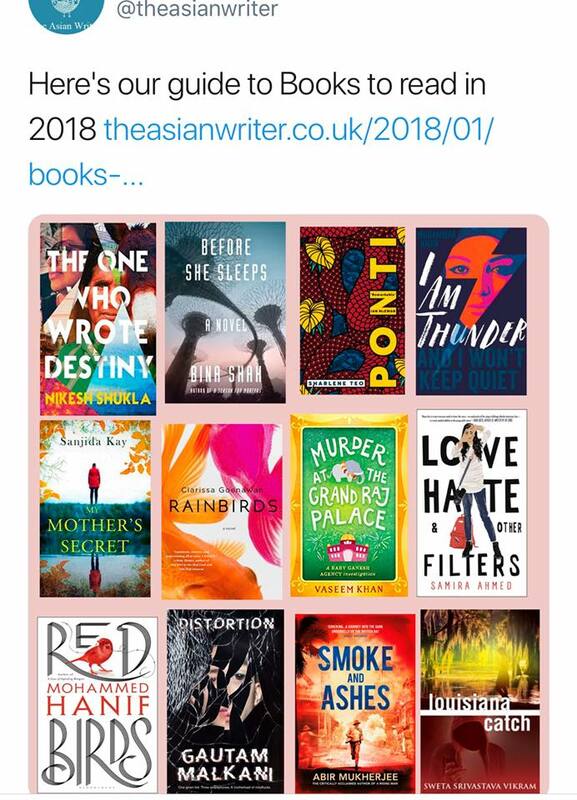 Sweta’s upcoming novel, Louisiana Catch, is on the list of Books to Read in 2018. Luna Luna Magazine interviews Sweta about her upcoming novel Louisiana Catch and women’s empowerment. Sweta is featured in Eastern Eye—Britain’s #1 Asian Weekly Newspaper. 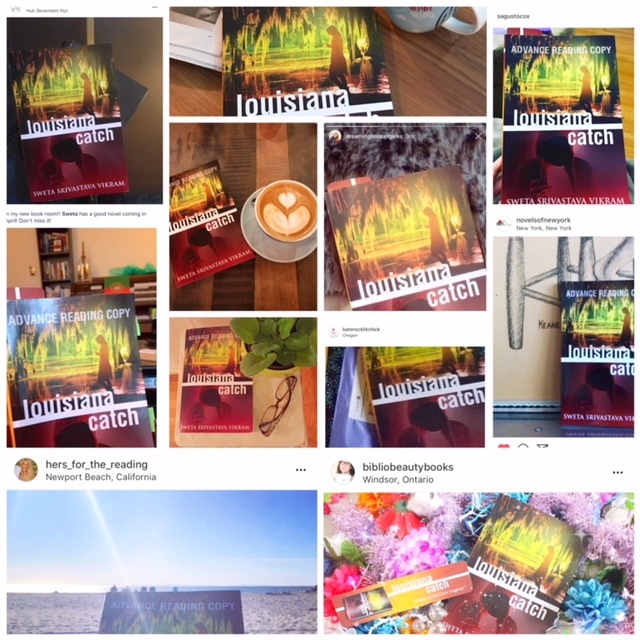 Early reviewers of Louisiana Catch share their reading-moments on Instagram. 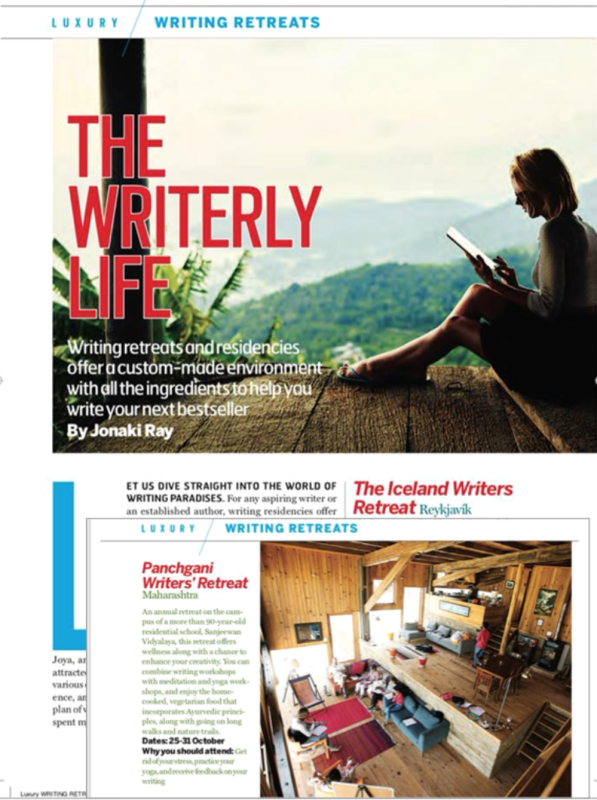 The Panchgani Writers’ Retreat, where Sweta teaches creative writing, yoga, and Ayurveda, gets mentioned in the Business World along with other amazing writing retreats from the world over. Dina Yuen of Asian Fusion interviews Sweta about writing, inspiration, wellness and much more. 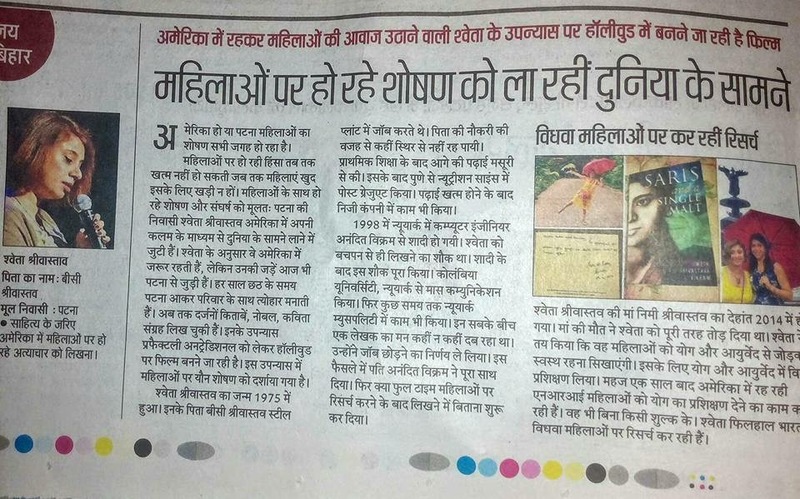 There is a write-up on Sweta in India’s leading Hindi newspaper, The Hindustan Times. NimmiLife CEO-Founder, Sweta is quoted in this article written by Felicia Stingone, the Chief Marketing Officer at Grind, where she talks about women entrepreneurs, women in leadership, and women’s empowerment. A young student interviews Sweta, for a confessional literary magazine, Luna Luna, about her Pushcart Prize-nominated book: “No Ocean Here”. Sweta has an interview in a prestigious magazine where she talks about Saris and a Single Malt, writing life, and her dedication to creativity and wellness being acknowledged in the same space. The Asian Writer interviews Sweta about her new book, Saris and a Single Malt, grief, healing, and confessional writing amongst other things. Eva Lucia interviews Sweta about her new book, Saris and a Single Malt, and asks truly thought-provoking questions. Chick with Bookstalks to Sweta about her mother, writing, and her latest book Saris and a Single Malt. Sweta’s interview about her book, Saris and a Single Malt, appears here. New York-based India.com interviews Sweta about her writing journey from middle school editor to award-winning author. Nicole Melanson of WordMothers talks to Sweta about her writing, inspiration, routine, and much more. England-based The Asian Writer interviews Sweta about her new book, Wet Silence, and asks truly thought-provoking questions. Sweta’s interview about her inspiration, motivation, and challenges about writing Wet Silence appears here. Sweta’s interview, about her book Wet Silence, appears in the very cool, hip, and progressive magazine Luna Luna. In honor of National Poetry Month, this piece was written about Sweta in Suko’s Notebook. Comparable to the Times or Newsweek in the US, MAG The Weekly, the leading magazine in Pakistan, interviews Sweta. Sweta does a radio interview with Dr. Karen Sherman to explore where couples get snagged in a relationship and how to get past them. Sweta donates copies of her poetry books to children in Africa who cannot afford to buy books. Find out more at World Reader. Listen to Sweta on Intent Radio talking to radio host Lisa Kirchner about creativity, inspiration, and New Year Resolutions. 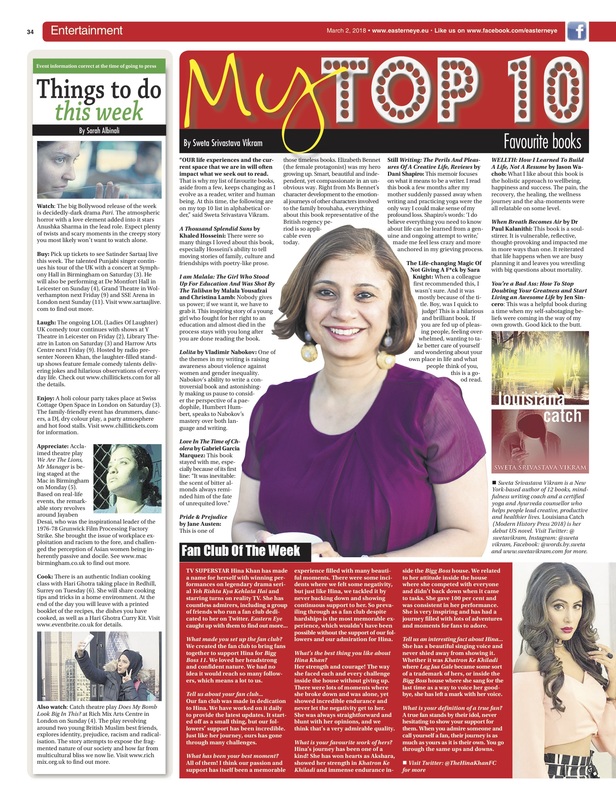 The Ten Spot–a fun interview where Sweta is asked ten unexpected questions. Sweta is voted Brown Girl of the Month. RTS reports on Sweta reading her poems at a fundraiser aimed at fighting human trafficking and ending modern-day slavery. Review Room does a piece about Sweta’s reading with noted South Asian writer Chitra Banerjee Divakaruni and others in Houston. The Asian Writer interviews Sweta about her latest poetry collection, No Ocean Here. Sweta reads her poetry at the Immigrant Heritage Awards and gets interviewed by Queens Tribune about her viewpoints on heritage and immigration. The Dan O’Brien Project: A Moment with Sweta Srivastava Vikram. Nancy Arvizu of Page Readers fame reads from Sweta’s book No Ocean Here on Blog Talk Radio. One of New York’s leading South Asian radio stations interviews Sweta about her latest poetry collection, No Ocean Here. Halabol, one of India’s leading news and media platform, talks to Sweta about No Ocean Here and her interests in social issues and her involvement in ending violence against women. Susan Karibian Ortlieb of Suko’s Notebook fame writes a short review about Sweta’s new book on the occasion of International Women’s Day. Sweta’s poem “Auto Immune Deficiency Syndrome” is now a part of an AIDS awareness film, The Dawn. Borderless News & Views interviews Sweta about her viewpoints on violence against women and her book-length collection of poems No Ocean Here. Newtown Literary Journal interviews Sweta about her literary journey and first nonfiction book: Mouth Full. Victoria Library in London, where Sweta did one of her readings, mentions her book Mouth Full. KAVIhouse, a poetry and literary segment aired on JUSPunjabi, an Astoria-based radio station, interviews Sweta about poetry, culture, Diaspora, arts, and much more! New York Daily News interviews Sweta regarding her involvement in Newtown Literary Journal as a board member. Poetry Wednesday interviews Sweta about poetry and her book Beyond the Scent of Sorrow. Front Row Monthly features Perfectly Untraditional in their magazine. Borderless News and Views interviews Sweta about her novel, identity, cultures, and fashion. Indian Book Reviews votes Perfectly Untraditional as the Best Read of the Month for March 2012. Sweta is named “Queens Person of the Week.” Watch her interview on NY1. Serena M. Agusto-Cox interviews Sweta for The Hopeful Librarian. Sweta gets a mention in “Lost in Fiction”: Blogger Susan Ortlieb for Lost in Romance | LOST IN FICTION. The Asian Writer, based out of the United Kingdom, interviews and features Sweta. Patna Daily does a write-up on Sweta. Irene Watson from Inside Scoop Live interviews Sweta. My Little Magazine (Singapore) takes a peek into the untraditional life of an Indian woman and discovers the intricacies of human relationships. Sweta talks to Adgully about how being a writer means juggling multiple roles. BookChums gets talking with Sweta about subjects that fascinate her and how growing up across continents has enriched her writings. Mid Day interviews Sweta discussing Perfectly Untraditional. Press clippings covering the India launch/readings of Perfectly Untraditional. The Hindu does a profile piece on Sweta when covering the launch of Perfectly Untraditional. NewKerala.com covers the release of Perfectly Untraditional. Listen to Sweta’s interview on Radio Mirchi. Sweta won the Azsacra International Poetry Award for her poem “Taste of India,” published by Taj Mahal Review in their June 2011 issue. Click here to read Sweta’s first travel interview based on her Indian-American identity. Read Sweta’s interview with Savvy Verse & Wit where she talks about poetry and her upcoming projects, amongst many other things. Hear Sweta talk about the significance of colors in India. You can also listen to the interview here: 26.Sep.2010 – The significance of Colors. The Asian Writer interviews Sweta. Sweta is interviewed by Irene Watson for Inside Scoop Live: 19.Aug.2010 – Irene Watson – Inside Scoop Live. Grab a cup of chamomile tea and read Sweta’s interview on Suko’s Notebook. Sweta talks to VAANI about her book, hobbies, and Shakira. VAANI announces the release of Sweta’s latest book, Because All Is Not Lost. Future Women Leaders interviews Sweta. Read Sweta’s interview on Hyphenated Spirit–Hyphenated Spirit celebrates the artistic contributions of diverse emerging artists and provides a venue in which they can express their cultural, personal, and societal views creatively.